Stealing pictures in the theater to remember the feeling. We weren't supposed to take any pictures or video. I remember poking around the internet when all of the sudden I stumbled across an announcement of the dates and locations of the upcoming auditions for my favorite dance show on TV. And that was that. I had decided that this was the year for me to audition. It was something I had been thinking about for years, each year discovering a different excuse for why I couldn't do it. But not this time. Everything was in place, I felt ready and the time was right. I was in the process of planning my move to New York and transitioning my career from dancing for the Cobo Brothers Dance company to venturing to a solo career in New York. I really had no excuses anymore. If there ever was a time to audition, this was it. So, I did. I made up my mind and nothing was going to get in my way of making it happen. On the road. Driving through my beautiful NC mountains towards Memphis, TN. I packed up my costumes, healthy snacks, music, dance shoes, hairspray and makeup. Packed up the car and set on the road with my boyfriend Rezza, my mom and my sister Adriana. Next stop, Memphis Tennessee! We had two rooms booked in a hotel and we were set to arrive the night before the big audition. James was flying there, so we would meet him at the hotel. The drive was beautiful, passing through my beautiful North Carolina landscape, until finally we made it to Memphis. We got a bite to eat, then straight to bed. I had an early morning and a long day ahead. So, we woke up before the sunrise. I put on my make up, did my hair and tried my best to keep the nerves in check. James and I got some breakfast, then we got in line outside the Orpheum theater where the auditions would be taking place. It was cold and there was an excited, nervous and slightly competitive energy in the air. This was it. 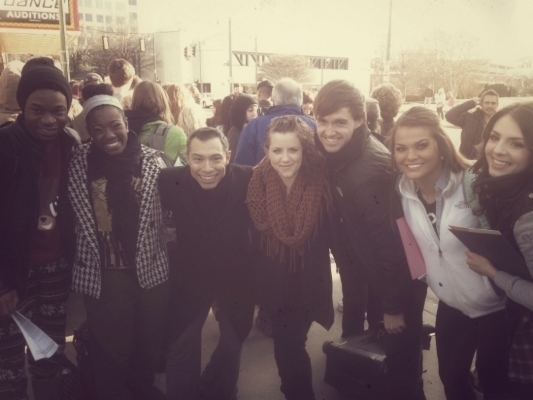 Cold,nervous, and excited waiting in line outside the Orpheum Theater in Memphis, TN. Sun is up and still waiting in line. As the sun started to rise we began making friends with the dancers around us. Pretty soon some of the production crew came out and started encouraging us to dance for the camera as we waited in line. We were making our own beats, dancing in the street and repeating stunts over and over so that the crew could be sure they got just the right two second shot they needed. It was exciting and exhausting. We were out there for hours. Still, it was so inspiring to be around so many talented dancers, all there to pursue the same dream. I will never forget it. Met some incredibly inspiring dancers there. So happy to have the support of my loved ones. Finally, they let us inside, handed out numbers, told us the rules and got the competition started. The first day was a group, freestyle round where we had to dance to music that we did not choose. We made it through that round and the sent us on to the next day of auditions. Day 2 and we got to meet the on air judges. It started to feel very real. We had to go through another round of freestyle before we could even perform our prepared piece. Luckily we made it through and James and I got to perform our routine. I felt really honored to be able to share this style of salsa to an audience that, honestly has very little exposure to the beautiful dance and culture of salsa. Salsa is still not a very commercially represented dance, and I will always remember the incredible feeling of being able to share just a little bit of that with the world. They asked me to continue on to the choreography round where we had less than an hour to learn a routine that exhibited multiple styles of dance with a partner we didn't know. Unfortunately, after performing the piece I was asked to go home, and that was the end of my audition. Yet, I was fortunate enough to have my audition featured on the show later that summer. It was incredible to think that there was something there that they felt was worth putting on national television even if I did not make it past that audition. My audition for the show So You Think You Can Dance, featured on air. I don't know if I will audition again in the future. I know I won't this year because I have other goals that I am pursuing. But I am so grateful to have had this opportunity and experience. It showed me that I am strong and willing to grow. It showed me that I am brave enough to put myself into difficult and challenging situations. I came away with a confidence that even though I am not a classically trained dancer, I have worked hard to get to where I am and that is something to be proud of. It also taught me humility and a drive to continue training, learning and growing as a dancer. I learned that I truly love dance and it inspired me to really chase after my dreams. Every success comes from the many failures and setbacks that come before it and I was inspired to take my next leap in my dance and personal life, move to New York City and chase after my dreams with a hunger and passion I hadn't quite known until then. I know this was a long post, so I want to thank you for reading it. It is an experience that I will never forget and that taught me so much, so I wanted to share that with you all. Stay brave, humble and passionate. Go after your dreams and when you fall down or get knocked around by the process, stay strong and keep on fighting. Because that is what it is all about, the fight. Without it, the wins wouldn't mean quite as much.